week day is finally here. I know you're all relieved-ha! Anyway, I'm going to do my best to post a Hodgepodge the week after, but Internet connections and all that jazz, so we'll have to see how things go. I'll at least post a message so you'll know for sure, but for now plan on no Hodgepodge on Wednesday, Nov. 2nd, hopefully a Hodgepodge on Nov. 9th, and definitely a Hodgepodge on Nov. 16th. Now back to today. Hodgepodge Day! Here are my answers to this week's questions. If you've played along add your link at the end of my post, then leave a comment for the blogger linking before you. We like to keep it friendly here on this side of the pond. My mom's home? It was my childhood home so going back there for visits feels easy and natural. Also the water, the Chesapeake, and East Tennessee. The powder room in the new house. It started with hubs and I choosing a vessel sink we both liked, but then our decorator found a spectacular cabinet and she and I decided we needed a bigger sink to fit the dimensions of the piece as well as the French feel it adds to the room. And since she and I like drama in the powder room and time was of the essence we selected something fabulous while hubs was out of town-ha! I tried to describe the sink to him, but it came out (in his mind) sounding like a mixing bowl and he couldn't really get past that so my powder room sink has been referred to as the mixing bowl ever since. It is not a mixing bowl. It looks nothing like a mixing bowl. I told hubs maybe he should step away from the powder room and channel his design energies into his garage. That I will handle the powder room and he will love it. He does. Oh my word, it's definitely a home run. We still need to hang the mirror (swoon!) and the window treatment, and once that happens I'll post a picture. I love the Christmas ornaments my girls made as they were growing up. I love pulling them out every year and remembering the sweetness of daughters in the house. This is a fun question. As it happens I've seen half the castles listed- Mont St.-Michel, Edinburgh Castle, Neuschwanstein Castle, Windsor Castle, Hampton Court Palace, and Leeds Castle. Windsor is my favorite btw. That leaves half still to be seen, and of those I'm going with Chateau de Chambord because it's France and j'aime toutes les choses francaises. I'm not a fan of giving homework for the sake of giving homework, and I do think excessive amounts of homework might be an unnecessary evil...BUT! Grasping new concepts and skills requires practice and sometimes that means practice at home. Not all homework is a waste of time. Wow-too many to narrow it down to one...ice skating on the Duck Pond, walking back and forth to the elementary school, riding my bike to the swim club, the Covered Bridge, breakfast at the local diner, trick or treating in the neighborhood...I could go on. And on and on. Good morning, Joyce. I am so happy that you're finally getting to move in! I can't wait to see pictures of it on the inside with all the "pretties" you've chosen. Your deck is great! I know you are so thrilled that the move is finally here!! Wishing you a smooth transition and great weather....then take a boat ride! I feel the same way about homework--do not give homework just because one thought he should-use as a practice tool only. I'm so excited that y'all finally get to move into your new home! We are about to begin renovations and I've told the husband to just do what designer daughter and I tell him to do. So far, he's listening. LOL Of course, also so far, all we've completed is Baby M's nursery so... I love the Christmas ornaments my girls made throughout the years too. But I chose the Christmas quilt Reni made for me a few years ago. I love that thing and it never gets put away. It stays by my bed year 'round. Good luck on the move in. I hope all goes smoothly! CANNOT wait to see pictures! You are so going to love your castle on the lake. (I note that you see only glimpses of the water through the trees...lake associations at work I presume. ☺) I look forward to seeing more as you get settled in weeks to come. I'd definitely welcome seeing the bathroom sink that you describe. It is a joy to know that Hodge Podge posts can rescue me from total dim wittedness just when I need them most. Thank you! We will limb up trees to open up the view. Landscaping begins today and they are taking care of some of that. I couldn't share just one childhood memory either. Way too many to list! I hadn't seen the video so enjoyed it very much. The British Got Talent clips always seem more fun than the American ones for some reason. Thanks for another fun Hodgepodge, Joyce, and I wish you all good luck with the move! Can't wait to see photos when you are ready to share! Hugs. What a great view from your deck. Can't wait to see more photos once you are all moved in! Thanks for another great week at the Hodgepodge, especially in the midst of your move. Can't wait to see a photo of your powder room and the rest of the house, for that matter. So great that you will be in before the holidays. Good luck with the big move! Oh my word, but I'm swooning over your powder room too, and I haven't even seen it! I can only imagine how fabulous it's going to be once the finishing touches are placed. You amaze me with your attention to detail! OK, you know you'll have to show us that sink now. Good idea to have division of design: you, the powder room, your husband, the garage. Smart girl! I've said it before, but I'll say it again...the view from your house is to die for! Can't wait to see your powder room, as well! Best wishes with your move, next week! You sure have my curiosity stirred about the powder room. And, it appears your deck was also a hit out of the ballpark. That view is amazing! Sending good juju for an easy move, I know it can be very stressful. I'm looking forward to seeing photos of your new home. Love your new home. 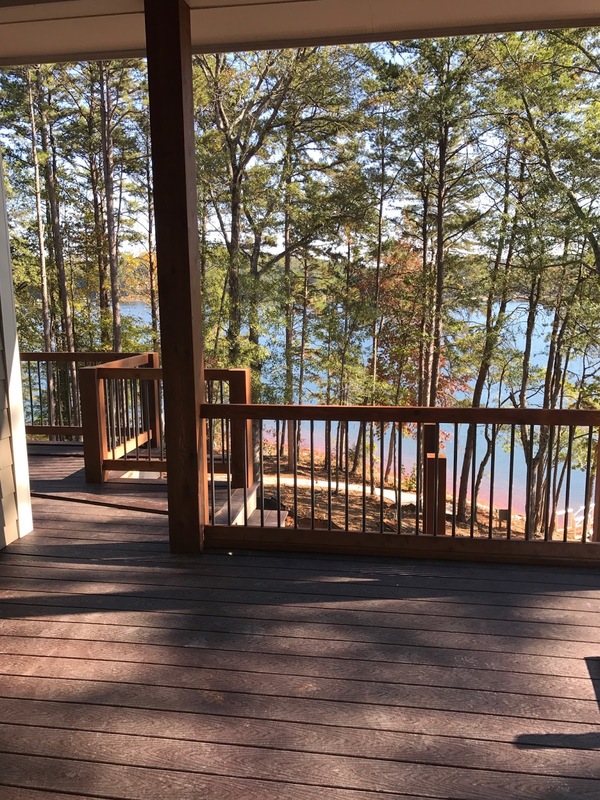 That view off your deck is perfect -- you can see the lake but people on the lake can't necessarily see you! Never seen that video, what a hoot. My folks are gone now, as well as access to the house, It was a very comfortable place. I did miss that yesterday and I will be out of town so that works for me. Hope your move runs smoothly! I'll be thinking about you. Hooray!!! Can't wait to see a picture of your powder room. Your decking looks awesome. Love the video, thanks for sharing. Best advice for moving, pile it all out in front of the old place and tell everyone it is an honor system yard sale. When they get done picking over the stuff, tell the trash people to take the rest. I hate moving. If it were up to me, we would just walk out and leave it all next time. SO excited about your new home - just a matter of DAYS now! YAY! Thank you for still doing the hodgepodge - I know how much it can be to move! Thanks for the video, gave me a good laugh today! Oh, I foresee many relaxing hours on that gorgeous deck. So excited for you! 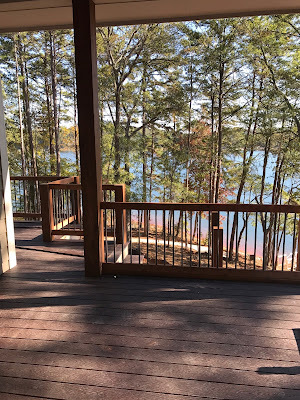 YOU are going to have an awesome view.. blessings in your new home! I , too, cherish the handmade ornaments from my kids and still have them. Wish you all the best in your new home. Good luck on your move. What an awesome adventure this has been. Thanks for sharing. SWMBO and I bought some wooden paint by number Christmas ornaments the first year of our marriage. They are a wonderful walk down memory lane each Christmas. You and I are in agreement on the "Homework" question. All the best with the move next week. I hope that you and Hubs have nothing but joyful times in your new home.